It wasn’t too long ago that I was on a development team working toward completing a software project by a release deadline and facing the challenges most software teams face today in developing applications. Challenges such as new project environment setup, team member collaboration, and the day-to-day task of keeping track of the moving pieces of code, configuration, and libraries for each development build. Today, with companies’ need to innovate and get to market faster, it has become essential to make it easier and more efficient for development teams to create, build, and deploy software. Unfortunately, many organizations face some key challenges in their quest for a more agile, dynamic software development process. The first challenge most new software projects face is the lengthy setup process that developers have to complete before they can start coding. This process may include setting up of IDEs, getting access to the appropriate code repositories, and/or identifying infrastructure needed for builds, tests, and production. Collaboration is another challenge that most development teams may face. In order to provide a secure environment for all members of the project, teams have to frequently set up separate projects and tools for various team roles and needs. In addition, providing information to all stakeholders about updates on assignments, the progression of development, and reporting software issues can be time-consuming. Finally, most companies desire to increase the speed of their software development and reduce the time to market by adopting best practices around continuous integration and continuous delivery. Implementing these agile development strategies may require companies to spend time in educating teams on methodologies and setting up resources for these new processes. To help development teams ease the challenges of building software while helping to increase the pace of releasing applications and solutions, I am excited to introduce AWS CodeStar. AWS CodeStar is a cloud service designed to make it easier to develop, build, and deploy applications on AWS by simplifying the setup of your entire development project. 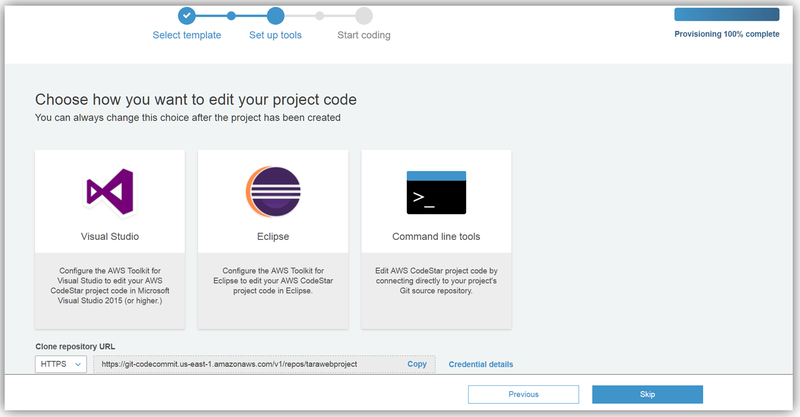 AWS CodeStar includes project templates for common development platforms to enable provisioning of projects and resources for coding, building, testing, deploying, and running your software project. Unified experience for access and security policies management for your entire software team. Projects are automatically configured with appropriate IAM access policies to ensure a secure application environment. 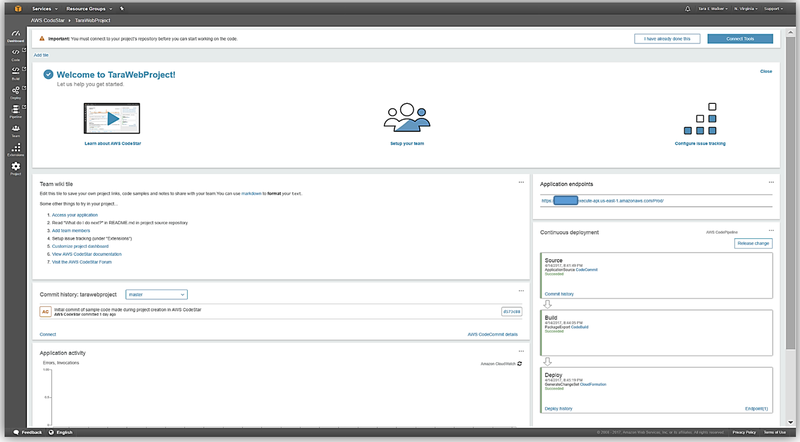 Pre-configured project management dashboard for tracking various activities, such as code commits, build results, deployment activity and more. Running sample code to help you get up and running quickly enabling you to use your favorite IDEs, like Visual Studio, Eclipse, or any code editor that supports Git. 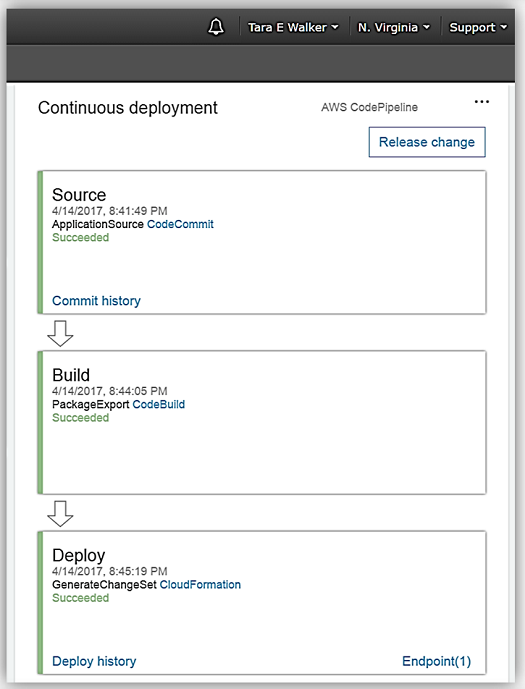 Automated configuration of a continuous delivery pipeline for each project using AWS CodeCommit, AWS CodeBuild, AWS CodePipeline, and AWS CodeDeploy. 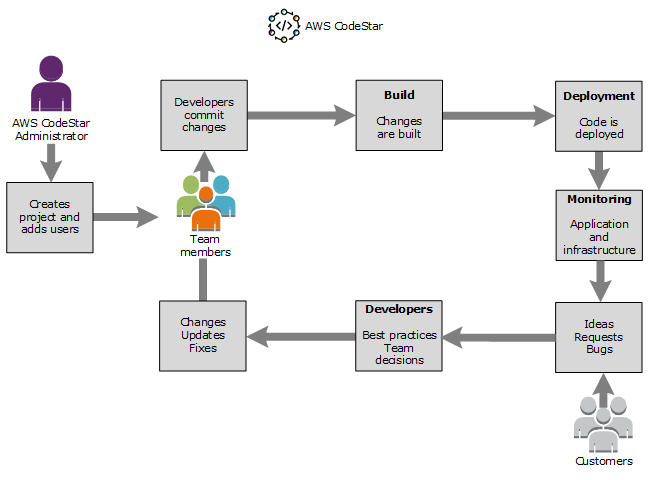 With AWS CodeStar, development teams can build an agile software development workflow that not only increases the speed in which teams can deploy software and bug fixes, but also enables developers to build software that is more inline with customers’ requests and needs. Now that you know a little more about the AWS CodeStar service, let’s jump into using the service to set up a web application project. First, I’ll go to into the AWS CodeStar console and click the Start a project button. 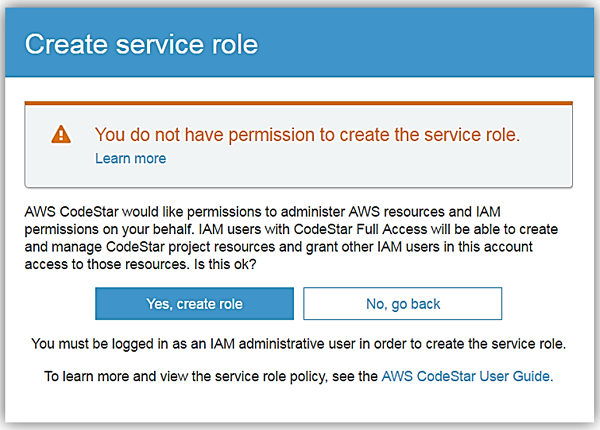 If you have not setup the appropriate IAM permissions, AWS CodeStar will show a dialog box requesting permission to administer AWS resources on your behalf. I will click the Yes, grant permissions button to grant AWS CodeStar the appropriate permissions to other AWS resources. However, I received a warning that I do not have administrative permissions to AWS CodeStar as I have not applied the correct policies to my IAM user. 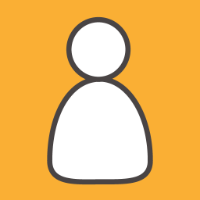 If you want to create projects in AWS CodeStar, you must apply the AWSCodeStarFullAccess managed policy to your IAM user or have an IAM administrative user with full permissions for all AWS services. Now that I have added the aforementioned permissions in IAM, I can now use the service to create a project. 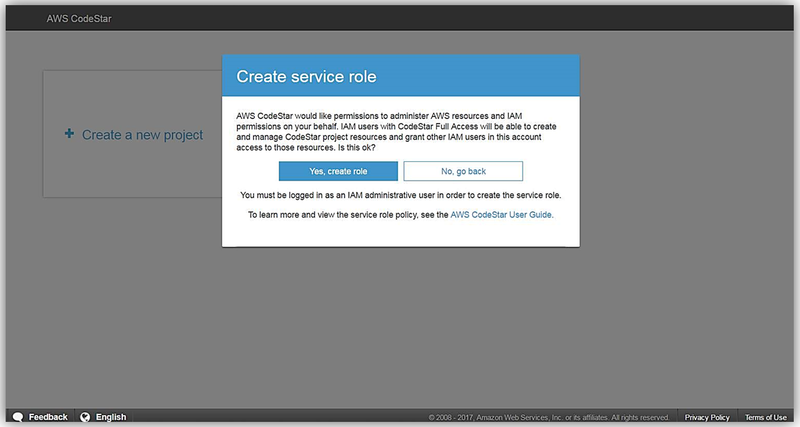 To start, I simply click on the Create a new project button and I am taken to the hub of the AWS CodeStar service. At this point, I am presented with over twenty different AWS CodeStar project templates to choose from in order to provision various environments for my software development needs. Each project template specifies the AWS Service used to deploy the project, the supported programming language, and a description of the type of development solution implemented. AWS CodeStar currently supports the following AWS Services: Amazon EC2, AWS Lambda, and AWS Elastic Beanstalk. Using preconfigured AWS CloudFormation templates, these project templates can create software development projects like microservices, Alexa skills, web applications, and more with a simple click of a button. 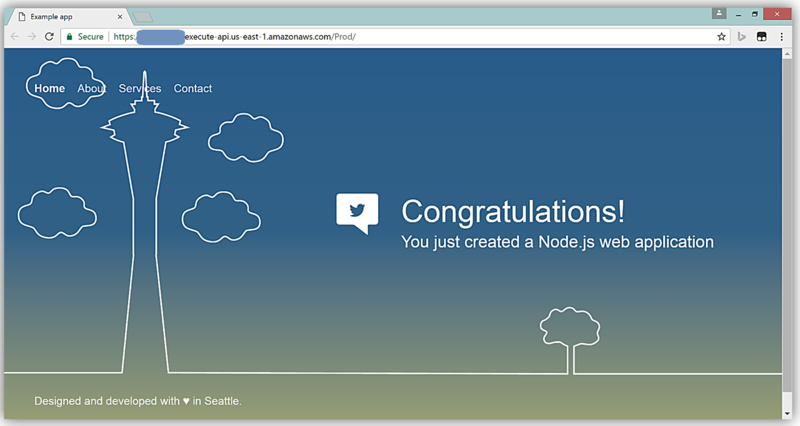 For my first AWS CodeStar project, I am going to build a serverless web application using Node.js and AWS Lambda using the Node.js/AWS Lambda project template. You will notice for this template AWS CodeStar sets up all of the tools and services you need for a development project including an AWS CodePipeline connected with the services; AWS CodeBuild, AWS CloudFormation, and Amazon CloudWatch. I’ll name my new AWS CodeStar project, TaraWebProject, and click Create Project. Since this is my first time creating an AWS CodeStar, I will see a dialog that asks about the setup of my AWS CodeStar user settings. I’ll type Tara in the textbox for the Display Name and add my email address in the Email textbox. This information is how I’ll appear to others in the project. The next step is to select how I want to edit my project code. I have decided to edit my TaraWebProject project code using the Visual Studio IDE. With Visual Studio, it will be essential for me to configure it to use the AWS Toolkit for Visual Studio 2015 to access AWS resources while editing my project code. On this screen, I am also presented with the link to the AWS CodeCommit Git repository that AWS CodeStar configured for my project. The provisioning and tool setup for my software development project is now complete. I’m presented with the AWS CodeStar dashboard for my software project, TaraWebProject, which allows me to manage the resources for the project. This includes the management of resources, such as code commits, team membership and wiki, continuous delivery pipeline, Jira issue tracking, project status and other applicable project resources. What is really cool about AWS CodeStar for me is that it provides a working sample project from which I can start the development of my serverless web application. To view the sample of my new web application, I will go to the Application endpoints section of the dashboard and click the link provided. A new browser window will open and will display the sample web application AWS CodeStar generated to help jumpstart my development. A cool feature of the sample application is that the background of the sample app changes colors based on the time of day. Let’s now take a look at the code used to build the sample website. 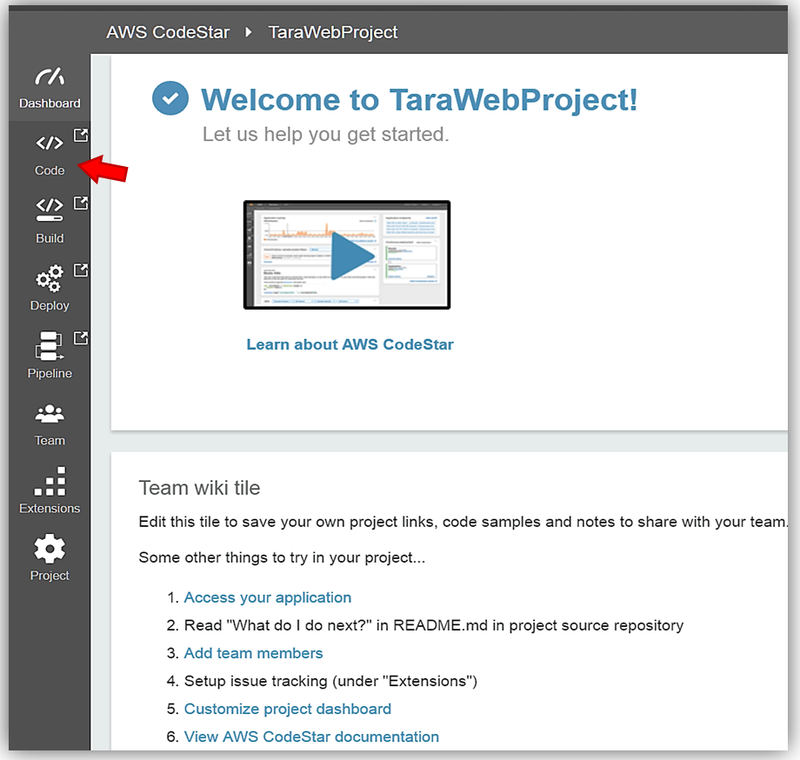 In order to view the code, I will back to my TaraWebProject dashboard in the AWS CodeStar console and select the Code option from the sidebar menu. This takes me to the tarawebproject Git repository in the AWS CodeCommit console. From here, I can manually view the code for my web application, the commits made in the repo, the comparison of commits or branches, as well as, create triggers in response to my repo events. 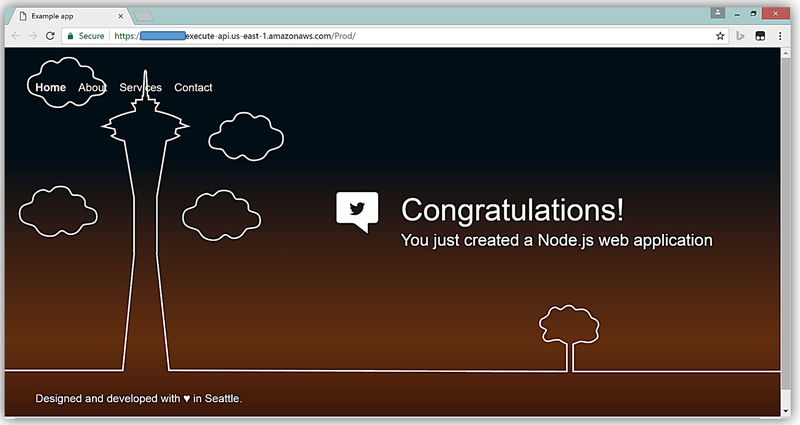 This provides a great start for me to start developing my AWS hosted web application. Since I opted to integrate AWS CodeStar with Visual Studio, I can update my web application by using the IDE to make code changes that will be automatically included in the TaraWebProject every time I commit to the provisioned code repository. You will notice that on the AWS CodeStar TaraWebProject dashboard, there is a message about connecting the tools to my project repository in order to work on the code. Even though I have already selected Visual Studio as my IDE of choice, let’s click on the Connect Tools button to review the steps to connecting to this IDE. Again, I will see a screen that will allow me to choose which IDE: Visual Studio, Eclipse, or Command Line tool that I wish to use to edit my project code. It is important for me to note that I have the option to change my IDE choice at any time while working on my development project. Additionally, I can connect to my Git AWS CodeCommit repo via HTTPS and SSH. To retrieve the appropriate repository URL for each protocol, I only need to select the Code repository URL dropdown and select HTTPS or SSH and copy the resulting URL from the text field. 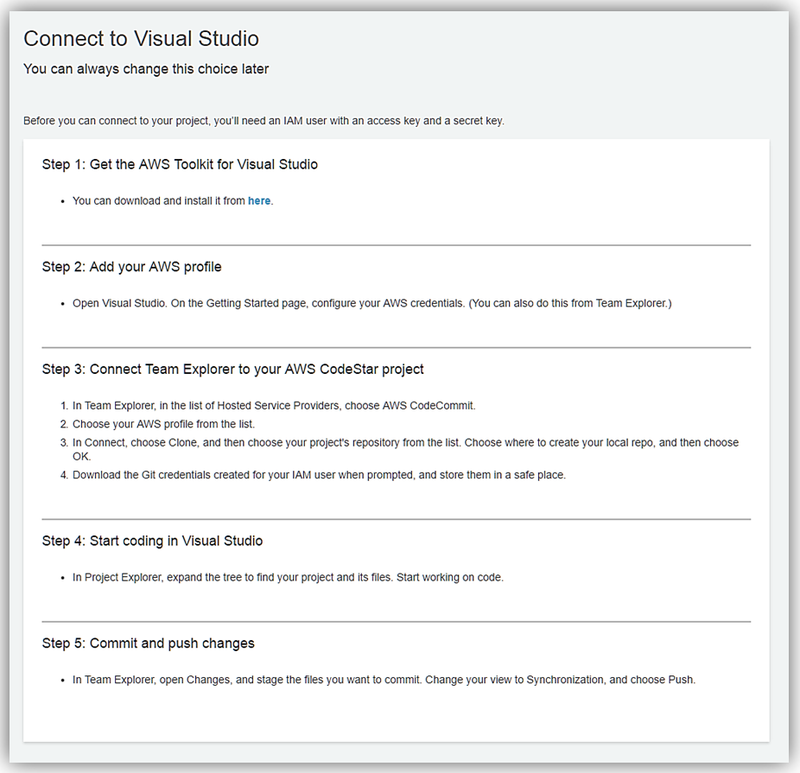 After selecting Visual Studio, CodeStar takes me to the steps needed in order to integrate with Visual Studio. This includes downloading the AWS Toolkit for Visual Studio, connecting the Team Explorer to AWS CodeStar via AWS CodeCommit, as well as, how to push changes to the repo. After successfully connecting Visual Studio to my AWS CodeStar project, I return to the AWS CodeStar TaraWebProject dashboard to start managing the team members working on the web application with me. First, I will select the Setup your team tile so that I can go to the Project Team page. On my TaraWebProject Project Team page, I’ll add a team member, Jeff, by selecting the Add team member button and clicking on the Select user dropdown. Team members must be IAM users in my account, so I’ll click on the Create new IAM user link to create an IAM accounts for Jeff. When the Create IAM user dialog box comes up, I will enter an IAM user name, Display name, and Email Address for the team member, in this case, Jeff Barr. There are three types of project roles that Jeff can be granted, Owner, Contributor, or Viewer. For the TaraWebProject application, I will grant him the Contributor project role and allow him to have remote access by select the Remote access checkbox. Now I will create Jeff’s IAM user account by clicking the Create button. This brings me to the IAM console to confirm the creation of the new IAM user. 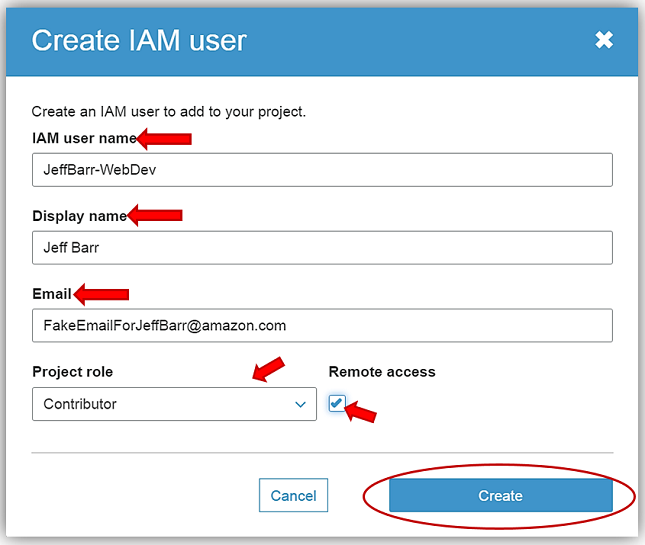 After reviewing the IAM user information and the permissions granted, I will click the Create user button to complete the creation of Jeff’s IAM user account for TaraWebProject. After successfully creating Jeff’s account, it is important that I either send Jeff’s login credentials to him in email or download the credentials .csv file, as I will not be able to retrieve these credentials again. I would need to generate new credentials for Jeff if I leave this page without obtaining his current login credentials. Clicking the Close button returns me to the AWS CodeStar console. Now I can complete adding Jeff as a team member in the TaraWebProject by selecting the JeffBarr-WebDev IAM role and clicking the Add button. I’ve successfully added Jeff as a team member to my AWS CodeStar project, TaraWebProject enabling team collaboration in building the web application. Another thing that I really enjoy about using the AWS CodeStar service is I can monitor all of my project activity right from my TaraWebProject dashboard. I can see the application activity, any recent code commits, and track the status of any project actions, such as the results of my build, any code changes, and the deployments from in one comprehensive dashboard. AWS CodeStar ties the dashboard into Amazon CloudWatch with the Application activity section, provides data about the build and deployment status in the Continuous Deployment section with AWS CodePipeline, and shows the latest Git code commit with AWS CodeCommit in the Commit history section. In my journey of the AWS CodeStar service, I created a serverless web application that provisioned my entire development toolchain for coding, building, testing, and deployment for my TaraWebProject software project using AWS services. Amazingly, I have yet to scratch the surface of the benefits of using AWS CodeStar to manage day-to-day software development activities involved in releasing applications. 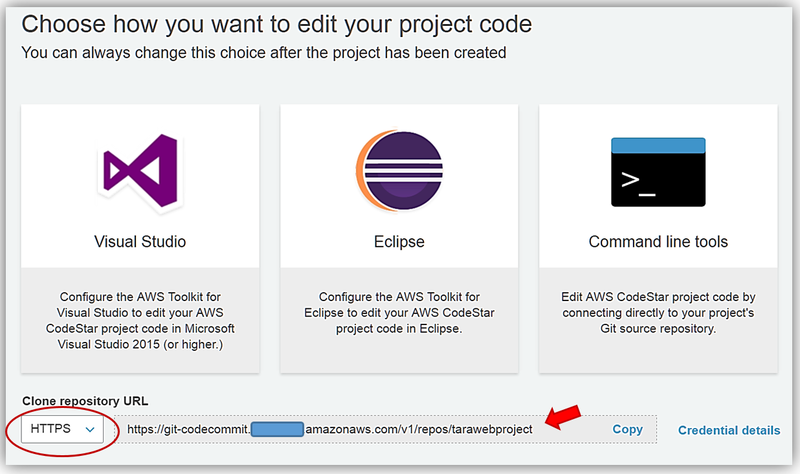 AWS CodeStar makes it easy for you to quickly develop, build, and deploy applications on AWS. AWS CodeStar provides a unified user interface, enabling you to easily manage your software development activities in one place. AWS CodeStar allows you to choose from various templates to setting up projects using AWS Lambda, Amazon EC2, or AWS Elastic Beanstalk. It comes pre-configured with a project management dashboard, an automated continuous delivery pipeline, and a Git code repository using AWS CodeCommit, AWS CodeBuild, AWS CodePipeline, and AWS CodeDeploy allowing developers to implement modern agile software development best practices. Each AWS CodeStar project gives developers a head start in development by providing working code samples that can be used with popular IDEs that support Git. Additionally, AWS CodeStar provides out of the box integration with Atlassian JIRA Software providing a project management and issue tracking system for your software team directly from the AWS CodeStar console. You can get started using the AWS CodeStar service for developing new software projects on AWS today. Learn more by reviewing the AWS CodeStar product page and the AWS CodeStar user guide documentation.